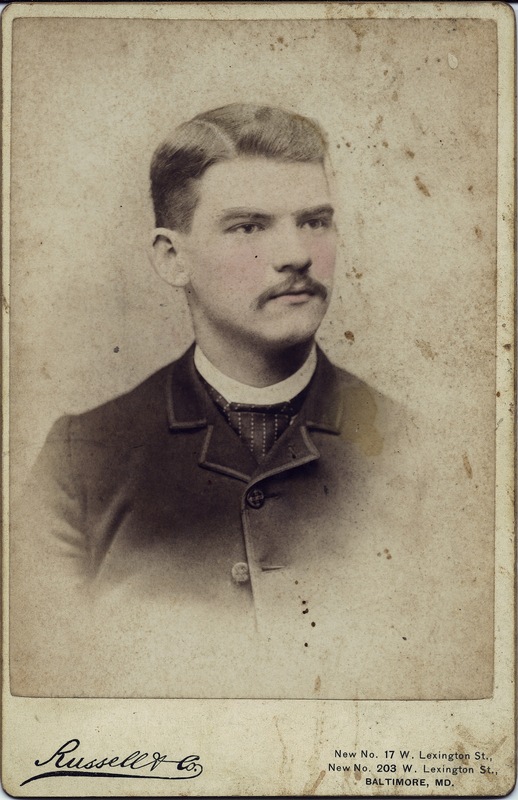 Category: Baltimore, Cabinet cards, Doctors, Dentists, Nurses, Russell & Co.
Of the six graduates of the University of Maryland Dental Department class of 1888 whose portraits I have written about, Fred Morton Wheeler is the only one who gave up dental practice. Son of Nashua, New Hampshire job printer Harrison Rodney Wheeler (1841-1898) and Nettie (Mills) Wheeler, Fred was born in April 1866 in Nashua. In 1900 he was practicing dentistry in Milford, New Hampshire, but by 1910 he was working as a printer. In 1920, he had a position as a clerk in the Manchester, New Hampshire post office, where he stayed for the rest of his known career. Their family’s ancestry is well documented, thanks to Albert Gallatin Wheeler’s 1914 work The genealogical and encyclopedic history of the Wheeler family in America. Fred’s grandfather was Daniel Wheeler (1789-1867), an Amherst, New Hampshire farmer. According to family historian Paul Wheeler, the family’s roots go back to American Revolution: great-grandfather Timothy Wheeler (1750-1826) served in Col. Nichols Regiment, New Hampshire Militia, and may have seen action at Fort Ticonderoga. Fred and his wife, Mary (Batten) Wheeler had one daughter. Mabel Florence (Wheeler) Lovering (1904-1996), taught school in Manchester before her marriage to Clarence E. Lovering (1905-2000). Wheeler had his portrait taken at the studio of Russell & Company. Ross Kelbaugh’s Directory of Maryland Photographers 1839-1900 dates Russell’s location at 17 & 203 W. Lexington Street to 1888, which corresponds nicely with the date of Wheeler’s graduation from dental school. For this vignetted bust portrait, the photographer chose to add a touch of rose to Wheeler’s cheeks, probably on the print, to highlight the sitter’s youth and health. Beautiful blog. I’ve enjoyed it very much. I have in my own possession an old family album that includes work from the Baltimore area, and roughly 1860 – 1910, as well as a photos from a few other cities. Because it’s not my family (although it came to be through marriage), I’m trying to find it a home. If you know how I might go about finding the best repository, I would be pleased to hear your advice. Thanks for reading my blog, Greg. . . . I think people tend to donate their old albums to the Maryland State Archives in Annapolis, Md., or the Maryland Historical Society in Baltimore. Hope this helps.